Post: Gaurav Akrani. Date: 9/09/2010. No Comments. Label: Economics, Study Notes. The term market has been interpreted in Economics as the place where both the buyers as well as the sellers meet and they buy and or sell goods. 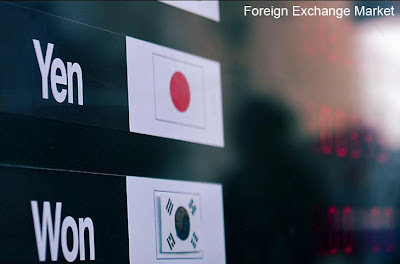 The foreign exchange market is a place where the transactions in foreign exchange are conducted. In practical world the external transaction requires the use of foreign purchasing power i.e. foreign currency. The foreign exchange market facilitates such transactions by performing number of functions. 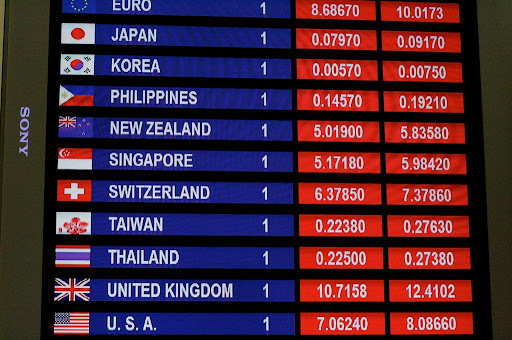 According to Paul Einzig, "The foreign exchange market is the system in which the conversion of one national currency in to another takes place with transferring money from one country to another." According to Kindleberger, "It is place where foreign moneys are bought and sold." In simple words, the foreign exchange market is a market in which national currencies are bought and sold against one another. There are large numbers of foreign transactions such as buying goods abroad, visiting foreign country for any purpose. Corresponding nation in whose currency the transaction is to be fulfilled. The foreign exchange market provides the foreign currency against any national currency. However, it is to be understood that unlike other markets, this market is not restricted to any particular country or any geographic area. There are large numbers of dealers' instruments such as exchange bills, bank drafts, telegraphic transfers (TT), etc. There are certain other dealers such as brokers, acceptance houses as well as the central bank and treasury of the nation. (A) Transfer Function : As mentioned above, the foreign exchange markets are exchange markets engaged in transferring the purchasing power between two nations and two currencies. It is prime function of this market. In simple terms, it is conversion of one currency into another such as converting Indian Rs. into U.S. $ and vice versa at some rate. Various instruments like bank drafts, exchange bills, are used for transferring the purchasing power. In this regard international clearing to both the direction is important to because it simplifies the conduct of international trade as well as capital movements from one country to another. (B) Credit Function : Under this function the foreign exchange market provides credit to the traders such as exporters and importers. Exporters can get credit such as reshipment and post-shipment credit. Recently started Euro-Dollar market is a leading credit market at international level. This function of making credit available plays a crucial role in growth and expansion of the international trade. (C) Hedging : Hedging is a specific function. Under this function the foreign exchange market tries to protect the interest of the persons dealing in the market from any unforeseen changes in the exchange rate. The exchange rates (price of one currency expressed in another currency) under free market situation can go up and down. This can either bring gains or losses to the concerned parties. Foreign exchange market guards the interest of both exports as well as importers, against any changes in the exchange rate. Thus, these are various functions performed by the foreign exchange market. To perform above functions it uses the following instruments. Cheques and Bank Drafts : Persons dealing with foreign exchanges can use bank cheques as well as bank drafts in order to make payments. The cheque is drawn on particular bank instead of a person. Bills of Exchange : It is also called as foreign bill of exchange which is an unconditional order in writing addressed by one person to another. It mentions the person to whom a certain sum is to be paid either on demand or on specific date. Mail Transfer (MT) : Under this, funds are transferred from one account of a destination to the another destination in the nation by mail. For international payments air-mail is used. Telegraphic Transfers (TT) : By this method a sum can be transferred from one place to another place in the world by cable or telex. This is the quickest method of transferring fund from one place to another. Thus, these are various instruments / methods used for inflecting International payments. 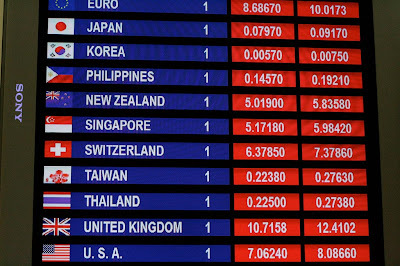 Exchange Rate can be defined as, "the amount of the foreign currency that may be bought for one unit of the domestic currency." It can also be defined as, "the cost in domestic currency of purchasing one unit of the foreign currency." Suppose the exchange rate between Indian Rupee and the U.S. Dollar is expressed as Re. 1 = $0.0211227 or $ 1 = Rs.47. It simply means the value of one Indian Rupee is 0.02127 dollars or in other words one dollar costs Rs.47. Thus, exchange rate is the price of one currency expressed in any other currency. In order to simplify the fulfillment of international transactions an expression of exchange rate is must in external economic transactions. Suppose an Indian importer wish to import goods from New York, then he must convert his Indian rupees in to U.S. dollars in order to make payments. However, on the other side when the U.S. importer buys goods in India, then he has to convert U.S. dollars in to the Indian Rupees. The rate at which this conversion takes place is called as an exchange rate. How this symmetry between two currencies is expressed i.e. how the exchange rate is determined is mentioned in the next section. However, it is to be understood that there are two fundamental types of the exchange rates. (A) Spot Exchange Rate : This refers to the price of foreign exchange in terms of domestic money payable for the immediate delivery of particular foreign currency. It is an existing or day-to-day exchange rate. It is an exchange of currencies on the spot. In simple words that rate of exchange, which is effective for spot transactions is known as the spot exchange rate. (B) Forward Exchange Rate : There are several future transactions whose delivery would be made sometime in the future. The rates at which these transactions are consummated are called as forward rate of exchange. It is the rate fulfilling the agreement between two parties based on future delivery of goods. The exchange rate which is applicable for forward transaction is called as forward exchange rate. The forward rate is expressed at par, at premium and at a discount. Three important thoeries for the exchange rate determination are. 1. Mint Parity Theory (Gold Standard) : However, the gold standard had collapsed during the First World War (1914 - 1918). Under the mint parity the exchange rate was determined on a weight-to-weight basis of the two currencies. However, after the break-down of the gold standard, there was confusion in determination of the exchange rate. Gustav Cassel a Swedish economist enunciated the theory of determination of the equilibrium exchange rate which was based in the parity between two currencies of the countries. 2. Purchasing Power Parity (PPP) Theory. 3. Balance of Payment (BOP) Theory.